I just finished reading Behind the Beautiful Forevers, a marvelous book by Katherine Boo. 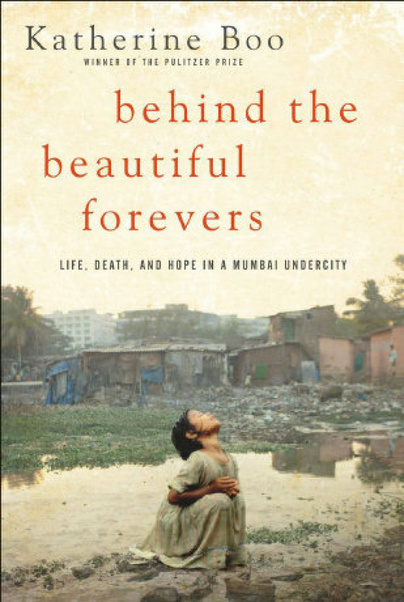 Katherine Boo spent 3 1/2 years living in a slum in Mumbai and has written a most beautifully written and moving account of the struggles and lives of the inhabitants of an Indian undercity. The book often reads like fiction, though it is not. Boo, her interpreters, and researchers were able to get very close to some of the slum dwellers depicted in the book. In doing so she gives an original perspective and voice to poverty that is primarily through her subjects eyes. I highly recommend this book.